Why Catholic Season 3 is due to start on Monday, 04 September 2016. The theme is The Profession of Faith – What we Believe. Why Catholic Books are available in the repository at R40,00, and each SCC is expected to have a copy of The Catechism of the Catholic Church. Inviting old and new Catholics, Leaders and Members of Sodalities, Youth, Young Adults, Catechism Teachers, Members of Liturgy Committee and all. Come Get Answers to Questions You Were Afraid to Ask!!! Have you ever asked yourself “Why am I a Catholic?” Has anyone else ever asked you this? Are your reasons clear to you? Have they changed over the years? have they deepened? Has being a Catholic helped you to understand the Word of God? And equally important , has it made an impact on how you live your life? Are you a Doer of the Word as well as a Hearer? In our constantly changing world, with increasing interactions with people of other faiths ( or no faith) NOW is a good time to take stock and find your own answers to these very important questions. You are invited to either form a group with friends and family or join others in the parish to meet weekly for 6 weeks using the booklet “Why Catholic” available from the repository for R40. 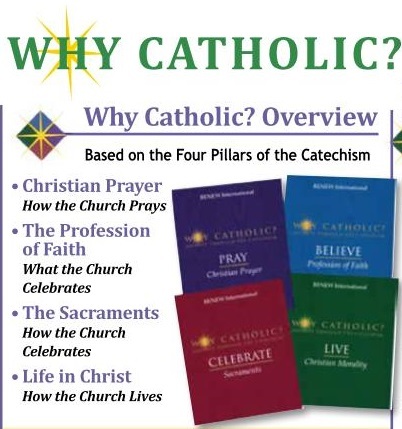 In addition the group can buy the Catechism of the Catholic Church which is the resource on which the programme is based. So don’t miss this opportunity to ask and answer that all important question “Why Catholic?” and if you need further information please call Marumagae Moshe at 0827868588.